Born in Greenwich, England in 1852, Alfred de Bréanski (the elder) was the oldest son in a Polish immigrant family. Although his father Leopold’s occupation is not recorded, two other siblings, Gustave and Julie, also became painters, thus suggesting that the family business may have been related to the visual arts. Certainly the young de Bréanski completed his training quickly, and made his debut at the Royal Academy in 1872 with Evening: Softly falls the even light, a landscape that was immediately purchased by the Bishop of Peterborough. By the 1870s, de Bréanski had already embraced landscape painting as his preferred subject matter. He traveled to the isolated regions of Wales and Scotland in search of wilderness landscapes, creating a unique blend of romanticism and realism. In a work such as The River Colwyn, North Wales from 1872, for example, the artist has presented a panoramic view of the rugged Welsh mountains surrounding the river, but he also concentrates on the texture in the grass and rock as well as the flickering light on the water and clouds. The meteorological accuracy of the sky alone would suggest the influence of John Constable, and certainly the work of both Constable and J. M. W. Turner would have been inspiring for any promising landscape painter in Britain at the time. However, these two extraordinary predecessors were also overwhelming; their contributions to the development of landscape painting was undisputed, and their work provided the stimulus for several generations to come—both in England and on the continent. As de Bréanski went about the process of establishing his own career, he sought to find his own expression within the broadly defined boundaries established by his aesthetic forebears. Like his Realist colleagues in France, he was fascinated by the texture of rock and earth and foliage, focusing attention on the minute details of a particular plant or craggy outcropping. In contrast, however, he remained firmly committed to the importance of a romantic pantheism in which the natural world itself encourages spiritual reflections, albeit not necessarily religious lessons. The undated Highland Loch with Angler and Cattle illustrates this point; the impressively detailed Highlands are swathed with clouds that seem to change even as the viewer observes the scene, progressing from sunlit white puffs to low-lying streaks of charcoal that threaten to drop rain at any moment. At the lake below, the cattle continue to drink despite the impending storm while the fisherman watches calmly from shore. Further, the range of color—and the juxtaposition of pure colors—hints that de Bréanski may have been aware of Impressionist color experiments. Yet the image is moody and subjective, akin to the English Romantic painters of the early nineteenth century who sought out landscapes untouched by industrialization. In 1873, just after his Royal Academy debut, de Bréanski married Annie Roberts, a Welsh painter in her own right, whom he met on his travels through Wales. Predictably, almost nothing is known about Roberts’ artwork, although she undoubtedly supported her husband’s efforts whole-heartedly. They raised a family of seven children, including Alfred, Jr. and Arthur who also became painters. The family connection to Wales, as well as his affection for the rugged landscapes he found there, encouraged de Bréanski to exhibit his work at the Royal Cambrian Academy in addition to his London venues. He was not alone in his enthusiasm for the mountainous region of North Wales, and by 1881 a group of artists banded together to form a new “academy” where they could exhibit their work and promote the visual arts in Wales. Queen Victoria officially recognized the group in 1882, thus adding “royal” to the organization’s name. Over the next twenty years, the Royal Cambrian Academy expanded its exhibition schedule, as well as its membership, eventually settling in Conwy where it remains today. Back in London, de Bréanski routinely showed his painting at both the Royal Academy and the Royal Society of British Artists, an alternative group chartered in 1887. He also exhibited with the Royal Institute of Oil Painters, founded in 1882. As its name implies, the only artwork on display here was oil painting, but the organization attracted a variety of artists at its annual exhibitions, including de Bréanski’s contemporaries, Lawrence Alma-Tadema and Walter Sickert as well as the French artists, Henri Fantin-Latour and Auguste Rodin. With his career well established by the 1880s, de Bréanski settled into life in the eastern suburbs of London, and continued to travel regularly to Scotland and Wales, developing his own unique expression of these still remote locales. 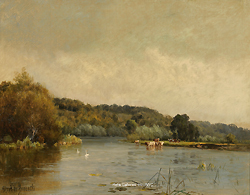 Less well known are de Bréanski’s landscapes of the Thames River where he kept a houseboat. His 1881 painting, Henley Regatta, offers a modernist perspective on this traditional five-day rowing competition, again with strong suggestions that he was very much aware of the painting then current in Paris. Like the boating images of Gustave Caillebotte, Claude Monet or Mary Cassatt, this composition positions the viewer above the action—perhaps on a bridge—where the foreground is cut off as it might have been in a photograph. Similarly, the use of unadulterated colors, and the play of flickering light on the water mirror the techniques that Monet and Pierre-Auguste Renoir pioneered at La Grenouille in 1869. Despite the lack of recorded documentation of trips to Paris, de Bréanski’s work evidences detailed knowledge of the Impressionist’s work, a fact that only underscores his wide-ranging awareness of the aesthetic innovations in the late nineteenth century. Both prolific and distinguished, de Bréanski exhibited at the Royal Academy until 1918 when he seems to have retired from public life. He died ten years later in London at age 66.